I admit. I bought this product because it is so aggressively advertised in Croatia that I really got curious. Maybe, I wouldn't have bought it if I didn't have a 50% off coupon, but since I had it, I took a risk. Its original price in Croatia is 39,90 kunas (about 4 GBP, $8, 5.50 Euros) and you can find it everywhere (drugstores, regular stores, everywhere). I bought it in DM. It comes in a 200 ml tube, which is convenient for the shower or the edge of your bathtub. I bought pink version (surprise, surprise) for damaged hair. It is advertised as a hair treatment for damaged hair but since they advice you to use it after every wash, I think that it is a stronger conditioner. I don't use it every time I was my hair, just once a week although I do wash my hair a couple of times a week because I have greasy hair. Could I use this one as my only conditioner? ABSOLUTELY YES! I don't know if you can tell, yet, but...I am pleasantly surprised with this product, and to be honest- I LOVE IT!!! This product is everything that semi di lino diamante mask should have been, but for quarter of a price, even if you buy it for its regular price. If you find it on sale or use a coupon like I did, it is not comparable at all. So much better deal for your money. 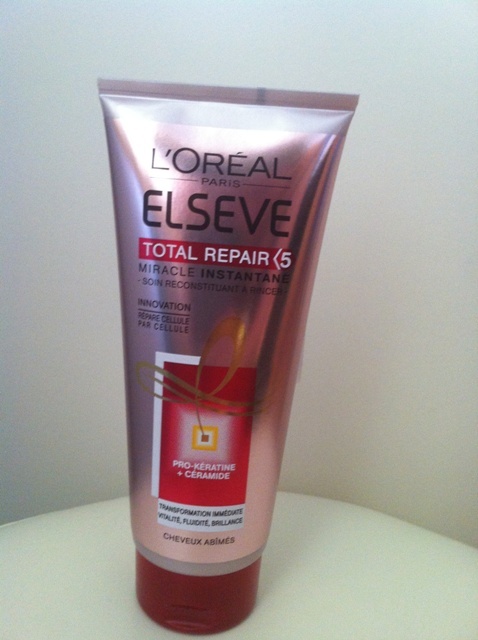 It is so efficient because of an innovative formula with PRO-KERATINE (a combination of 2 amino acids found in keratine, which repairs the hair fibre and reinforces hair structure so that it regains its strength like new) and CERAMIDE (a patented compound from L'Oreal Laboratories replicates hair's intercellular cement, transforming the hair's surface to an even and smooth condition). It is called Total Repair 5 because you solve 5 problems (damage, thinning, split-ends, brittleness and dullness) with only one solution. Your hair will feel stronger, look fuller, look revitalized, have a healthy-looking shine and feel silkier. The smell of this product is wonderful! I've gotten so many compliments that it really made me feel special. Not that I am not special all the time, but you know what I mean. I was walking along the seashore in my summer dress, had freshly washed hair, and people were turning their heads because of this wonderful scent and actually asked me what it was... I swear. It was like a commercial ;). Yesterday, the same thing happened. I don't know. Maybe I am femme fatale this year? Who knows? You can't really put too much product on. It is very forgiving. If you do that, just rinse it thoroughly and you will be fine. It even passed the ultimate test for me: combing out blond, colour treated hair. The comb was going through hair amazingly. No pulling, no damaging. Ughh... I loved it. You can apply this products from your roots to the ends (I do that) and it won't leave your roots greasy. It is even adviced to do so. Ingredients: aqua/water, hydroxypropyl starch phosphate, quaternium-87, stearyl alcohol, behentrimonium chloride, amodimethicone, cetyl esters, CI 19140/YELLOW 5, CI 17200/RED 33, hidroxypropyltrimonium hydrlyzrd wheat protein, hydroxycitronellal sodium hydroxide, arginine, trideceth-6, chlorhexidine digluconate, limonene, candelilla wax, linalool, benzyl salicylate, benzyl alcohol, propylene glycol, isopropyl alcohol, 2-oleamido-1,3-octadecanediol, caprylyl glycol, serine, cetrimonium chloride, glutamic acid, hexyl cinnamal, glyceryl linoleate, glyceryl oleate, glyceryl linolenate, parfum/fragrance. My verdict is that this one is for the Try list! Which product would you recommend? Will you try this? The product is really fine, I use it regularly instead of conditioner since I tried it for the first time. And the scent.. I totaly agree.. it is wonderful and it lasts quite long (longer or more hair makes it even more intense). I am glad that you also liked it. This is a great product. I tried many more expensive products before this one, and since I tried this one, and this is one of the best conditioners on the market. Especially for the price!